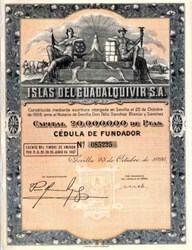 Beautifully engraved certificate from the Islas Del Guadalquivir S.A. issued in 1926. 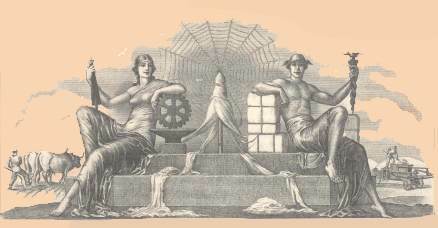 This historic document has an ornate border around it with a vignette of an allegorical man and woman sitting by a spider's web, with farmers working in the background. This item has the printed signatures of the Company’s Administrador and is over 75 years old. It was printed by printed by Talleres Offset, San Sebastian. Spain occupies 85% of the Iberian Peninsula, which it shares with Portugal, in southwestern Europe. Africa is less than 10 mi (16 km) south at the Strait of Gibraltar. A broad central plateau slopes to the south and east, crossed by a series of mountain ranges and river valleys. Principal rivers are the Ebro in the northeast, the Tajo in the central region, and the Guadalquivir in the south.